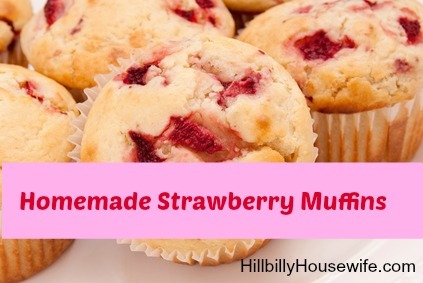 These homemade strawberry muffins are perfect when strawberries are in season.. They are yummy, look cute and best of all they freeze really well. 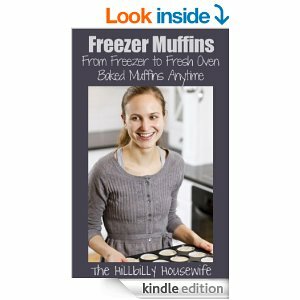 In fact the recipe is straight out of my Freezer Muffin Kindle Cookbook. In a small bowl, whisk milk, oil and egg, set aside. In a large bowl, mix flour, salt, baking powder and sugar. Toss in chopped strawberries and stir to coat with flour. Pour in milk mixture and stir together. Spoon batter into paper-lined muffin tin, filling the cups almost to the top. Put in freezer for about 3 hours or until frozen. Once frozen, transfer to a gallon size freezer bag and store for up to 4 weeks. To bake remove from freezer and place back into muffin tin. Bake at 375 degrees for about 30-35 minutes, or until the tops are golden brown. Ready for more delicious freezer muffin recipes?